Hi everyone! It's Laura here and today I am back with a post and a video in which I will show you how to create a snow globe shaker card. 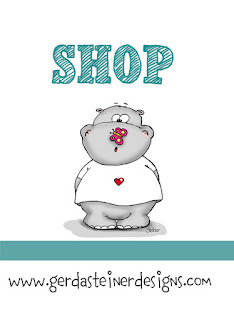 I chose the sentiment so that this could be a card good for any occasion, but you can easily switch that and turn this into a winter birthday card, for example. The stamp set I used today is the Gerda Steiner Designs Snowman Friends stamp set. I stamped the images on Neenah Solar White 110lb cardstock with Scrapbook.com Premium Hybrid Black ink and I colored them with my Spectrum Noir markers. There are also coordinating dies available for this set, and I will link them down below in case you are interested. I don't have them, though, so I cut the images with my EK success Cutterbee scissors. Here is a color chart for you as a reference, in case you'd like to reproduce this card. I then moved on to the shaker. I die cut some white cardstock with the Lawn Fawn Large Stitched Rectangle Stackables, and created an opening with the Lawn Fawn Ready Set Snow Shaker Add-on dies. Before die cutting the shaker window I adhered a strip of patterned paper from the Lawn Fawn Perfectly Plaid Winter paper pad. I then used more dies from the dies in Ready Set Snow Shaker Add-on set and patterned papers by Lawn Fawn to create the snow globe. For the base of the snow globe I used papers from the Knock on Wood paper pad, and for the sky I used the Beachside paper pad. All the other elements are die cut from white cardstock. To add interest to the snow hill, I added some shading with a Ranger Blending Brush. I took the brush that I normally used for my blue Distress Oxides and used whatever ink was left on the bristles to shade the bottom of the hill. For the inside of the shaker I used some Faux Snow and some Studio Katia Chunky Glitter, and I really love the look! Finally, for the sentiment I die cut the word hello from the MFT Hello There Die-Namics out of white cardstock and I glued it to the top left of my card front. I also decorated the inside of my card with one more snowman from the Gerda Steiner Designs Snowman Friends and with a sentiment from the Foxes stamp set, which I stamped with Memento Ink in London Fog. I also created a video showing you how to create this easy winter shaker card, you can watch it down below! And if you like it, don't forget to subscribe to my channel for more inspiration! And that's it for today! 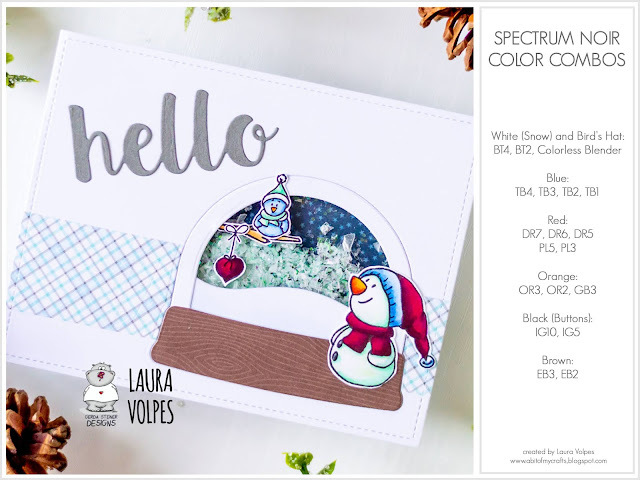 I really hope you enjoyed the post and the video, and I hope I inspired you to create with the Gerda Steiner Designs Snowman Friends Stamp Set. OHH deer it's not plying time!